InfoSAWIT, JAKARTA – PT. 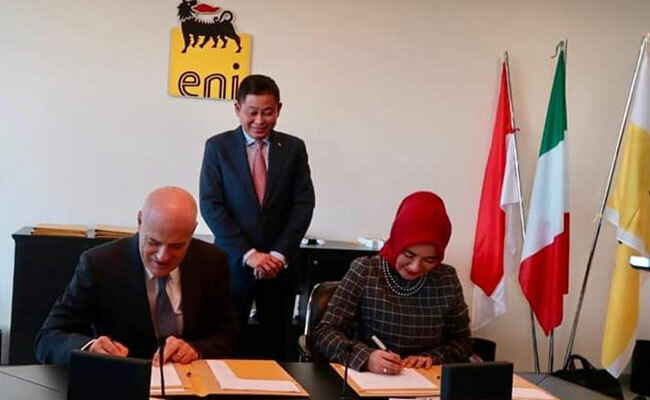 Pertamina and ENI, the Italian non-oil and gas company cooperated to sign three agreements last week in Rome, Italy. Two agreements were about to develop green refinery, that is, Head of Joint Venture Agreement to develop green refinery in Indonesia and term sheet of crude palm oil (CPO) processing in Italy. The agreements were the follow up of the memorandum of understanding (MoU) which was signed by PT Pertamina and ENI in September 2018 and in December 2018. The other was MoU about circular economy, low carbon products and renewable energy which was signed by Director of PT Pertamina, Nicke Widyawati and CEO ENI, Claudio Descalzi and witnessed by Minister of Energy and Mineral Resources, Indonesia, Ignasius Jonan. In the chance, Director of Processing, PT Pertamina, Budi Santoso Syarif said that the signing of Term Sheet CPO Processing and Head of Joint Venture between PT Pertamina and ENI was the important moment to develop the energy in Indonesia in the future to reduce the fossil energy usage. The cooperation to maximize the renewable natural resource potential in the domestic is the effort of PT Pertamina to reduce the crude oil import to energy independence nationally. “Indonesia has the source of green energy, that is, abundant palm oil. This is very potential in the future,” Budi said in the official statement to InfoSAWIT. He also said that PT Pertamina keeps maximizing the other renewable natural resources, such as, algae to fulfill the energy demand which keeps increasing both domestic and in global and controlling the CO2 emission. CPO Processing Agreement is the start for PT Pertamina to do CPO processing in factories of ENI in Italy for having many experiences since 2014 to produce HVO (Hydrotreated Vegetable Oil) that could be used as the mixture of diesel fuel. PT Pertamina and ENI would continue to discuss about the potential to develop green refinery in Indonesia to produce HVO. “PT Pertamina has succeeded to process CPO with co-processing in the refinery within the pilot project in Kilang Plaju, South Sumatera which has been operating since December 2018. The factory produces green fuel, green LPG and green avtur by using CPO up to 7,5 percent,” Budi mentioned.